It’s a ‘sign of the times’, there’s indisputable evidence of the damage humans are causing to the environment – we all know that we should be travelling more sustainably, but very few of us are actually making that effort. On top of the environmental impact that modern day travel brings, there’s also the impact on human health. Not only through atmospheric pollution, but also consequences from physical inactivity and failing to gain the health benefits that ‘active’ travel might bring. Nearly all of us are guilty of not altering our travel behaviours – and most of us are somewhat reluctant (and perhaps a bit lazy) to change. Most of us see the convenience of our own car, even for short journeys. We don’t care about the consequences – both to the detriment of our own and the environment’s health. So how do we change that, especially with regard to travel to our place of work? 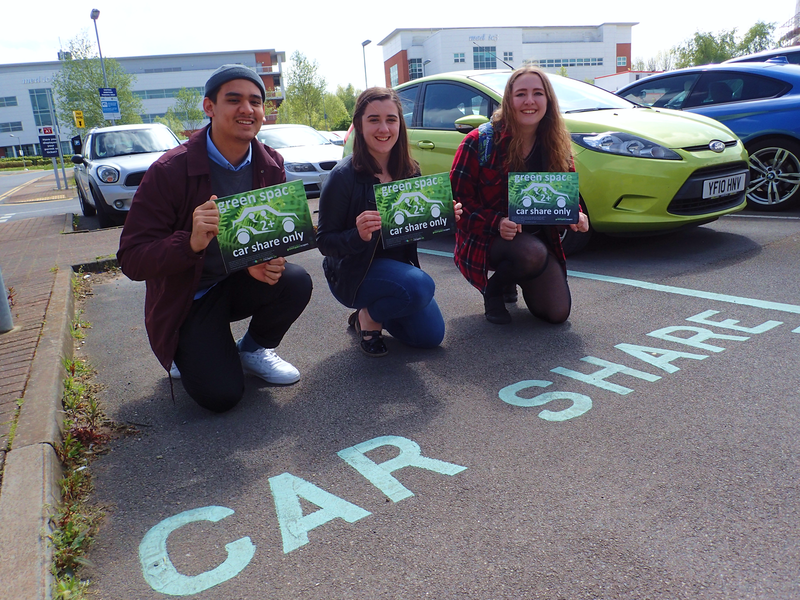 That’s the question we’ve posed to 3 students Imogen, Isobel and Syahmi, studying Environment and Sustainability, here at Keele. Together with Human-Nature we’re instigating a project to raise awareness on sustainable and active travel issues, through a new signage range. We are aiming to bring all sections of the campus community together in a coordinated effort – to make an even greener Keele. We think it’s a project that’s an ideal fit with Keele’s world-renowned health and environmental focus – also with its reputation as such a beautiful ‘green space’. As well as raising awareness of greener travel options, through our unique new ‘green space’ signage concept that we’ve developed, we’re linking this project to a wider campaign to get people more active. To really get people moving – not just to ‘think green’, but ‘act green’! Our students are seeking to identify and engage with ‘Green Space Champions’ right across the Keele campus – that’s students, staff and business community alike. This will not only help us raise that awareness, but also to seek feedback from those champions, on how we, and they, can really make a positive ‘environmental impact’ at Keele. We want to find those people willing to put their head above the parapet and really want to challenge the systems, attitudes and behaviours that inhibit more sustainable travel. We want to find those people willing to get things moving on how we all do our bit to ‘go green’ and travel more sustainably. 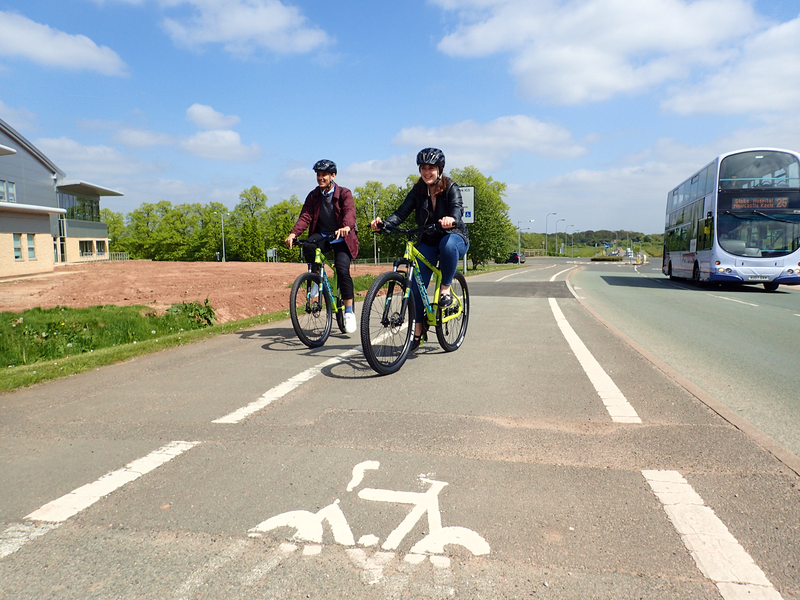 With all the business, academic brains, and bright young minds here at Keele, there must be a way to further improve how the campus performs on sustainable travel. But first, think about how you travel to Keele (or your place of work) and decide where you would park yourself on the Sustainable Travel Hierarchy (shown above). Do you yourself occupy a green space on the hierarchy with your own mode of travel, or are you like most of us – down there at the bottom? What steps could you, or are you prepared to take to move one (or more steps) up that hierarchy? We’re trying to champion this as an initiative, but we suspect that there are other like-minded people within the Keele campus, who might want to support this effort. Do you know an environmental or wellbeing champion within your department or workplace? Are you that person? Can you work with us to positively influence attitudes to encourage people to change their travel behaviours, or offer support for our initiative? Or do you share our desire to support community and workplace wellbeing? Do you have an interest in wanting to support your colleagues’ social, physical and mental wellness, using green spaces? Sustainable Travel | how sustainable are we? Keele University, and to the same extent its sister site University Hospital (UHNM), like many large institutions which attract high numbers of attendees, face an ever increasing battle to meet their sustainable travel targets. 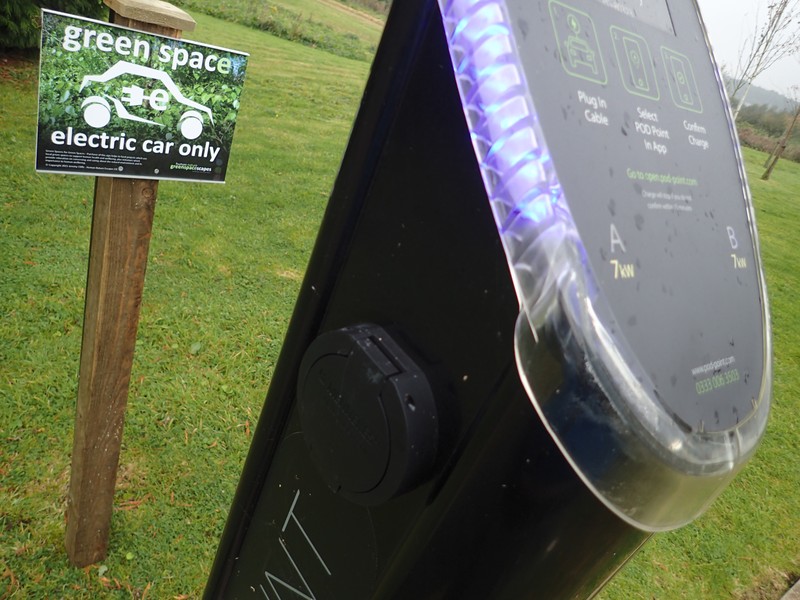 Inevitably as sites grow and attract increasing personnel and visitor numbers, this creates an ever growing demand for car parking – and this flies in the face of their best efforts to become more sustainable. The bottom line is the ‘car’ still seems to be the most favoured way to travel, but enviably most car journeys tend to be single occupancy. This does nothing to help the environment, local traffic congestion, and isn’t very economical for the driver either! On top of that, facilities like Keele (and its sister site UHNM) simply won’t sustain their projected vehicular parking needs without some intervention action – there simply isn’t enough physical space left for any more parking! 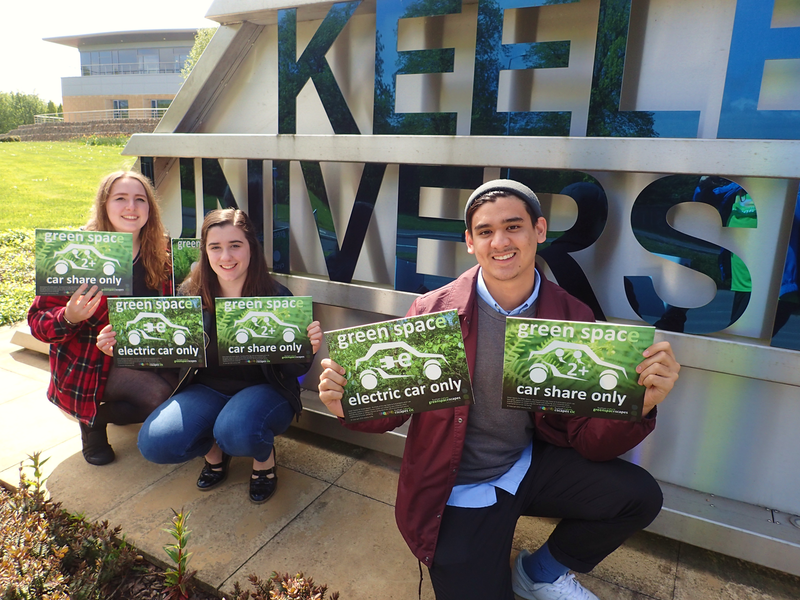 This begs the question, for a campus like Keele, which puts great emphasis on its green and environmental credentials – in relation to sustainable travel, just how green is it? Moreover, what can be done about it? Good intentions with fully documented sustainable travel plans are one thing, but actually changing people’s travel behaviours is quite another. However here at Human-Nature we’ve got faith in the folk at Keele. We see, and feel sure that they will see the benefits of making that important linkage between human and environmental wellbeing needs – and see that the two are inextricably linked. A good healthy environment supports good healthy humans, it’s as simple as that. 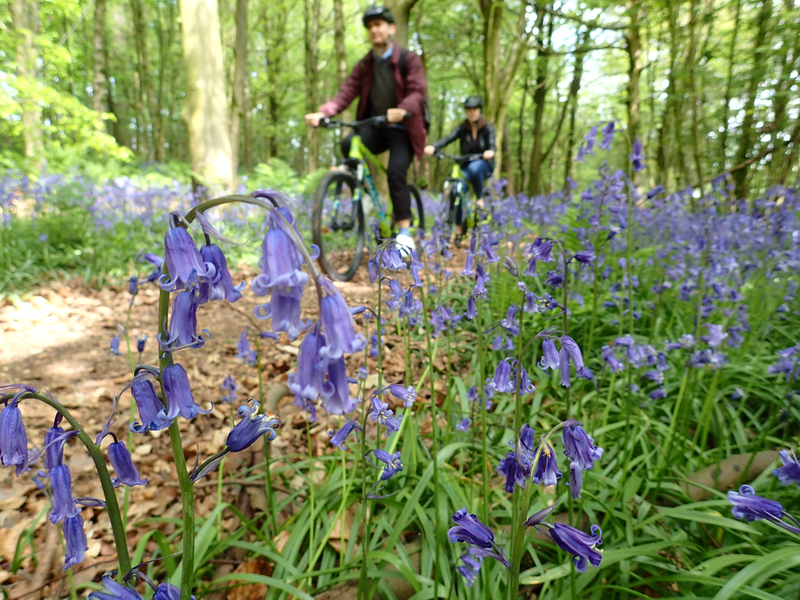 Our community interest company (as a social enterprise) taps into the positive health benefits that ‘green spaces’ (natural spaces) bring – and from our experience we know that the environment in turn supports positive social, physical and emotional wellbeing. We’re hoping that Keele recognises this too. With its health links to UHNM and its academic excellence in health and environmental innovation, were looking for support of our initiative – from staff, students and the business community alike. 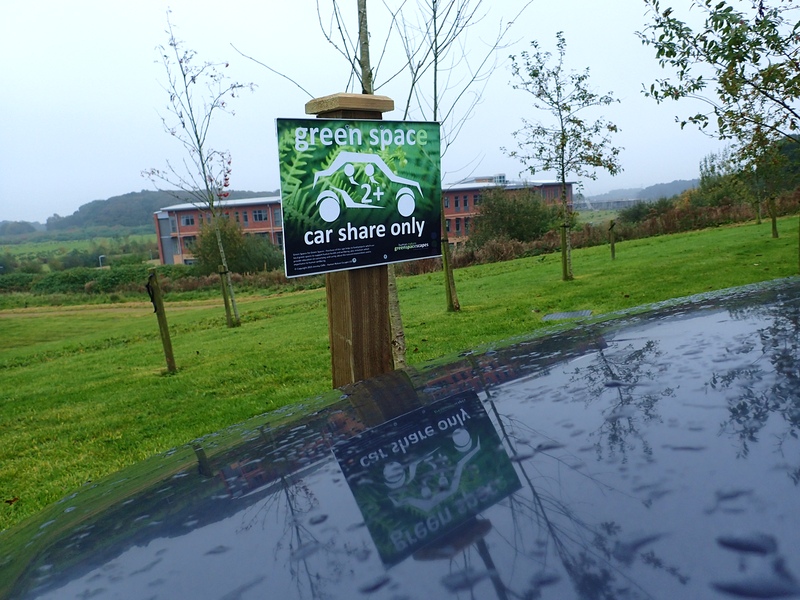 In an effort to support Keele’s aim to become more sustainable in its travel behaviours, our artists here at Human-Nature have come up with a ‘green space’ signage concept which informs, educates and encourages more sustainable forms of travel to (and from) the campus. Of course, change to signage alone won’t change anything, only changes to modes of travel of travel will – and only people (humans) can make that change for the betterment of the environment, their health, or their own pocket. Our signage concept is, however, quite innovative. 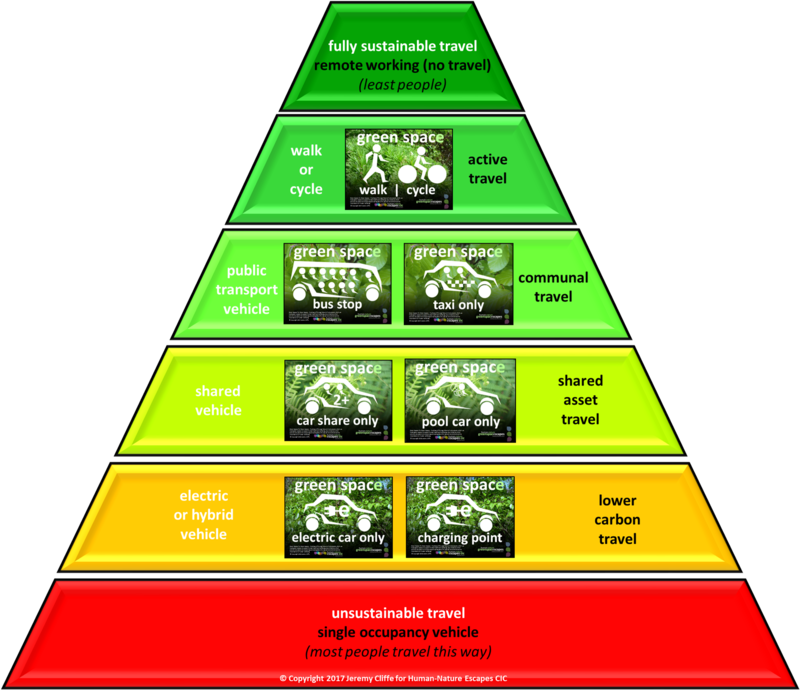 It draws together all aspects of travelling more sustainably into a ‘unified’ approach, neatly linking to a sustainable travel hierarchy (shown above) which aims to inform on the most sustainable ways to make your journeys to Keele. Interestingly enough, the most sustainable ways to travel are in fact the most economical to the person travelling. For instance, the average saving for car sharing a journey to work is around £1,000 per annum. Even more significant savings can be made by cycling or walking to work, which also bring with it health benefits from increased physical exercise (which are now known to bring about mental health benefits too). We hope that Keele will become the first adopter – and a reference site for our signage concept. As a ‘profit for purpose’ social enterprise, the revenue generated from sales of the signs will go to support local community wellbeing (including specific initiatives to support the social, physical and emotional health of staff and students here at Keele). It’s important to remember that as we continue to lead ever increasingly hectic and stressful lives, we shouldn’t forget the benefits that ‘green spaces’ can bring – especially for those needing respite, recovery and support for ongoing resilience. Who knows, changing your travel habits may not only help your own wellbeing, but by supporting our initiative and promoting it with your employer, it may help others too. Human-Nature Escapes will use revenue generated from signage sales to support their wellbeing activities programme for general community wellbeing (and we’ll be specifically trying to help individuals recover and remain resilient from stress, depression and anxiety) – using of our fabulous local Staffordshire ‘green spaces’. May 8th also marks the start of Mental Health Awareness Week (#MHAW17) from the Mental Health Foundation, encouraging us to think about whether we’re ‘surviving’ or ‘thriving’ – and what steps we can take to look after our mental health, and build resilience to cope with the demands of life. Travelling to work in a more sustainably way could perhaps do far more than just improve your financial health, but if you travel active, it could improve your physical health and maybe even your mental wellbeing too! We’re launching our signage product idea, and asking not only Keele but the wider UK businesses and organisations to back our ‘green spaces for green spaces’ project – a project truly supporting both people and planet. thescapeartists have been busy ‘being creative’, designing a product that will in turn support our greenspacescapes green exercise initiative. 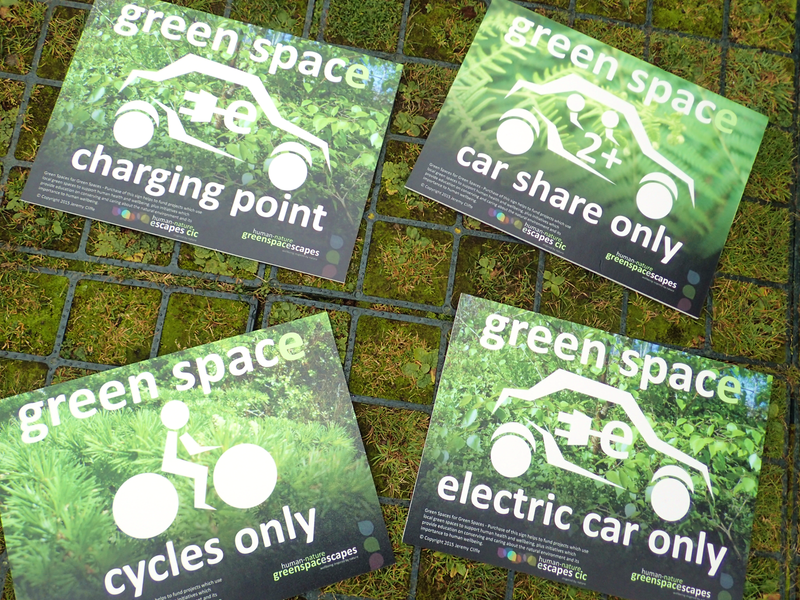 We’ve been designing with both ‘people and planet’ in mind to develop a range of innovative signage products to help businesses reduce CO2 emissions, and to travel to work in a way that doesn’t cost the earth. Income generated for the sale of these products will help fund our work on human wellbeing too, making it a WIN-WIN-WIN for business, for community and for environment. Yes it’s a play on words (green spaces) – the use of green (parking) spaces to support environmental wellbeing, and the use of green (natural) spaces to support human wellbeing. (The fresh Spring greenery featured in the background of the signs are photo images of trees captured here in our local Staffordshire landscapes, including Keele). 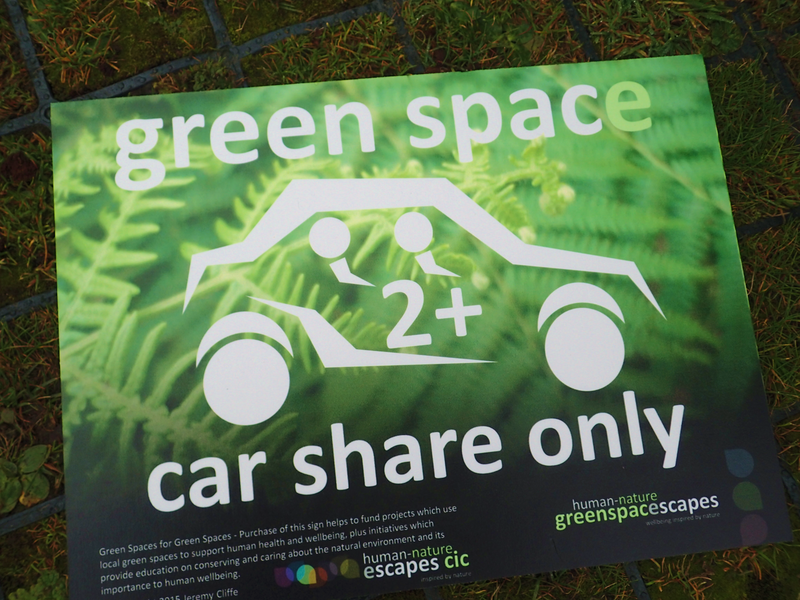 It’s really a simple concept (simple is often best), creating a unified and matching range of ‘green spaces’ parking signs – which link neatly to the sustainable travel hierarchy. In situ and when installed, the signs would serve as a constant reminder of more sustainable ways to travel and how we could all do our bit for the environment (and possibly our own health) – through car sharing (2+people), using electric or hybrid vehicles, using public transport, or cycling to work. Packs of 10 weatherproof and fade resistant signs, suitable for wall mounting, start from £240 (exc delivery). We are also developing a range of post mounted signs which are suitable for mounting to existing street furniture, such as bollards. Please Contact Us to express an interest, or if you think our initiative is a good idea, please pass on a link to this page to your environmental or wellbeing representative. By ‘buying social’ from us you’ll not only be helping the environment, but supporting people with emotional wellbeing problems like stress, depression and anxiety to use green spaces to support and nurture their recovery – how social is that?! It’s a great way for your organisation to demonstrate Corporate Social Responsibility (CSR), as a combined management and employee workforce initiative. 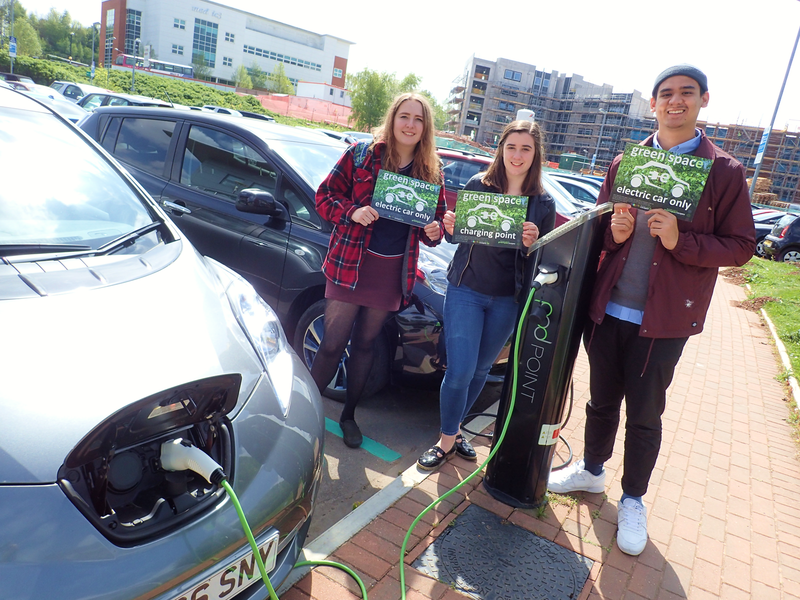 We are also eager to hear from any companies or organisations specifically targeting sustainable travel, cycling, car sharing or electric vehicle use, public transport use, or promoting active travel – to help us market and promote this product.